The humble taco has taken on a variety of forms in kitchens across Tulsa. Using the simple formula of tortilla + protein + veggies + cheese, chefs are creating imaginative taco concoctions with flair. Jerk chicken with Caribbean spices replaces grilled meats flavored with cumin. Sometimes meat is replaced all-together to create a vegan-friendly taco. And move over salsa, because a tangy romanseco sauce is a delectably dangerous doppelgänger. These aren’t the traditional tacos from one of the taquerias in Tulsa. These are tasty twists on an Oklahoma mainstay. Don’t think of it as taco appropriation; it’s taco appreciation. So take a walk on the wild side and give these faux tacos a try. Chimera is where all the cool kids hang, and their breakfast tacos are all the rage. Named after Sonic Youth songs, the flavor combos are a heady mix of traditional Mexican with a modern vibe. The Disappearer is a self-fulfilling prophecy in taco form; filled with egg, bacon, cheddar, chipotle crema and cilantro, these tacos will disappear quickly from your plate and into your belly. 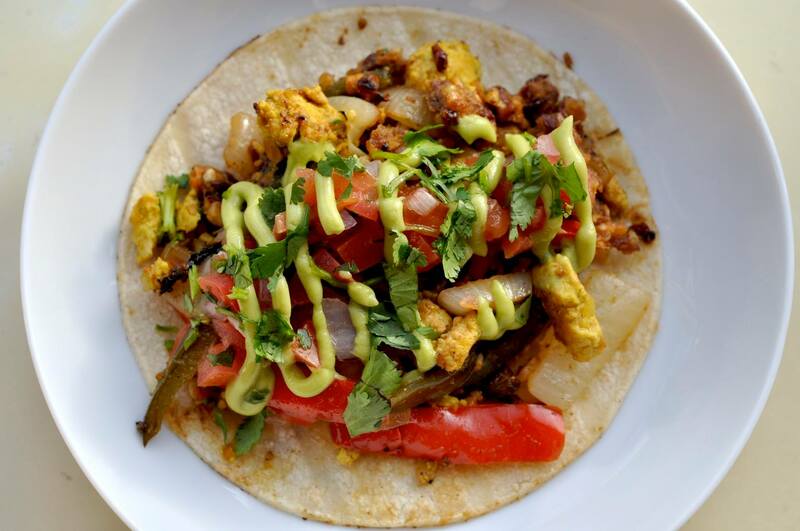 The Tokyo Eye is a vegetarian-friendly option with an Asian twist, featuring tofu scramble, smoked adzuki strips, poblano sauté, and avocado crema. Chimera also serves up a damn fine cup of joe and, bonus, they have a full bar at your service. Lola’s approach to tacos is a lesson in fresh. Shredded chicken that’s been simmered in a proprietary blend of adobo seasonings delivers a subtle heat, then is topped with avocado, red onion, cotija cheese, sour cream and cilantro. But the brightly-hued romanesca sauce is what sets it apart. A mixture of roasted red peppers, nuts and olive oil is blended to a beautiful sunset orange, and is ladled gently on top of the taco. It’s so pretty, you almost don’t want to eat it. Almost. 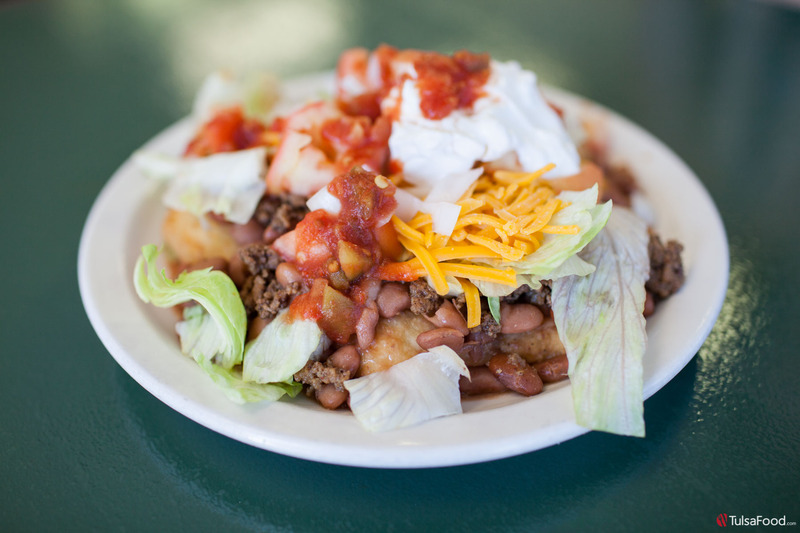 The Indian Taco is a treat that all Okies savor, but it’s usually only available during the fair or at special events. 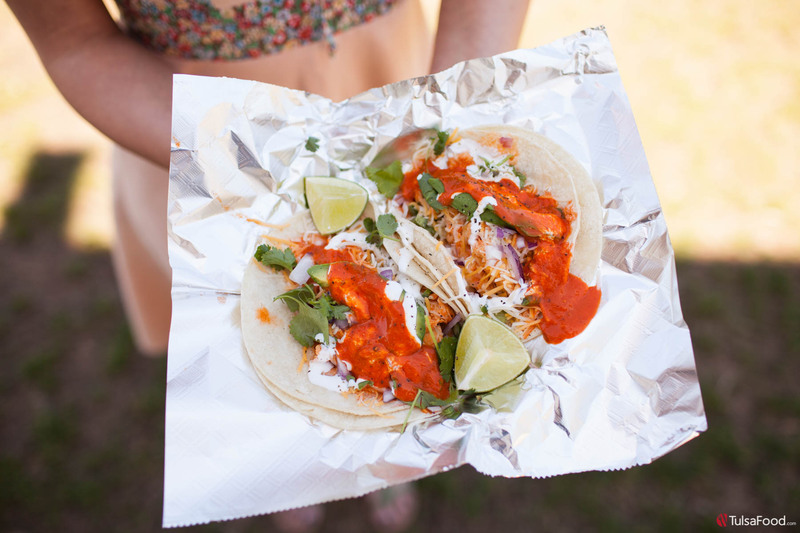 Luckily, this TulsaFood sleuth has discovered the perfect place to get your Indian taco fix. A quaint spot called Johnson’s Stepping Stone Café in Bixby serves Indian tacos every Wednesday; and they are divine. The fry bread is decadent, with the perfect density and the perfect amount of sweetness. They grind their hamburger in house at Johnson’s, which gives the taco meat a distinctly beefy flavor, and the homemade pinto beans are a velvety addition to the taco. Of course, no Indian taco would be complete without tomato, lettuce, onion, sour cream and salsa. It may be one of the best Indian tacos this food writer has ever had. 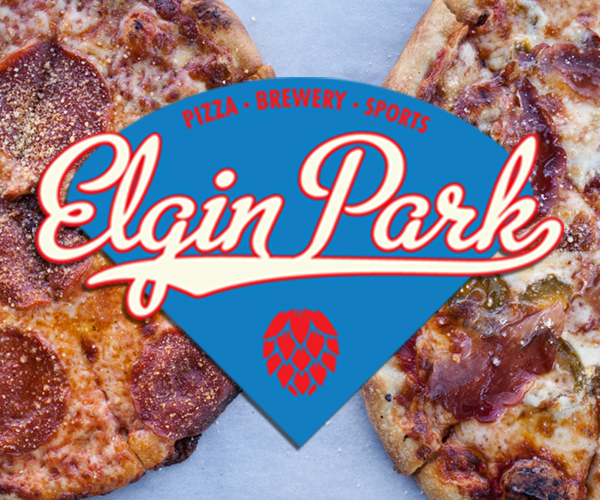 So, on Wednesdays, you’ll know where to find me. 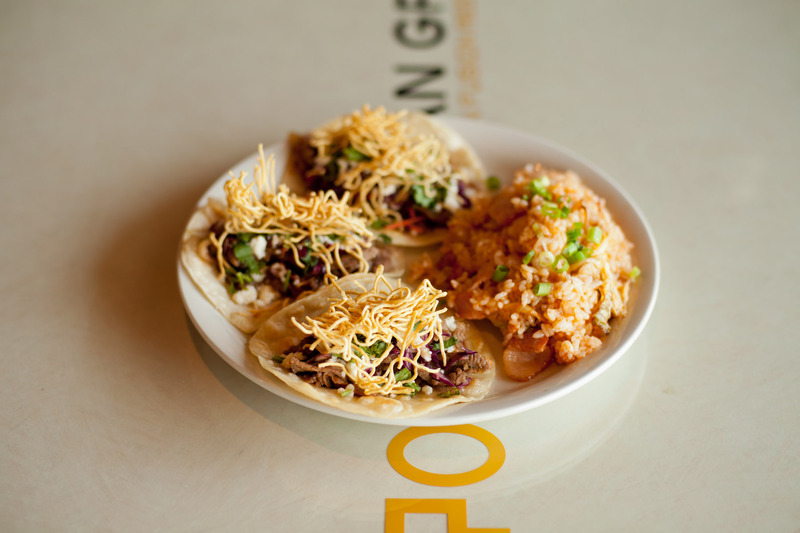 Owner Samon Xiong credits his time in LA for the Korean Bulgogi Tacos on his menu. ““In L.A. there’s a big Mexican section near Koreatown, so Korean-Mexican fusion just seems a natural. I didn’t see any of that in Tulsa, so I thought, why not give it a shot?” The result may look similar to a traditional Mexican taco, but with a decidedly Korean twist. You can choose either pork or beef bulgogi, which is seasoned with a spicy bulgogi sauce and crushed Korean red peppers, then topped with Asian slaw and toasted sesame seeds. 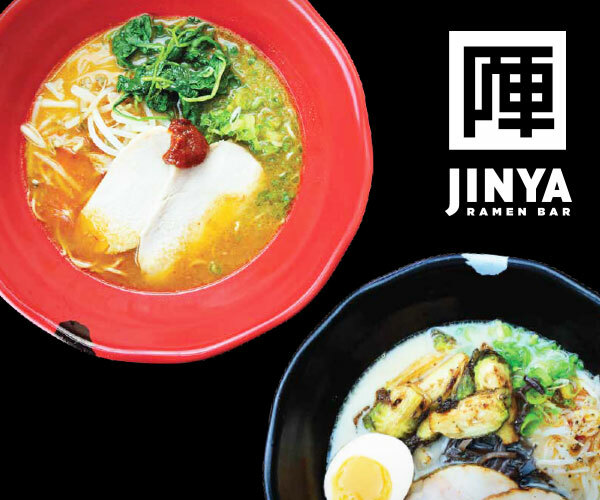 The other Korean Mexican fusion items on their menu prove that this is a match made in flavor heaven. Soul City is the new hot spot along Route 66 where artists, musicians and artfully-created food meet. Their taco creation is a beautiful blend of Caribbean-spiced jerk chicken, topped with Soul City’s signature slaw, cilantro and queso fresco. 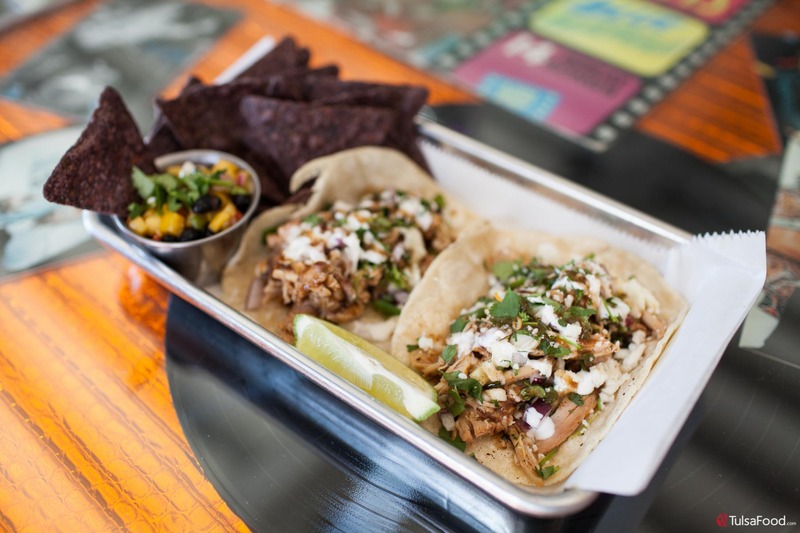 The black bean and mango salsa is wonderful on its own, but when paired with the taco, it’s what one of our TulsaFood correspondents described as “drip-down-your-chin good.” The Soul City taco provides a fulfilling experience in more ways than one. It’s safe to say that Tulsa is a bit taco obsessed. Realistically, every day is Taco Tuesday around here. So as a group of fanatical taco fans, we are fortunate to have local chefs who aren’t afraid to challenge what we think a taco should be. They’re playful spins keep our taco love stoked, and for that, we say gracias.